When you want to change colors in crochet projects, two things are going through your mind – where and how. Whether you’re following a pattern or a concept in your head, you likely already know where you want to change colors but you’re looking for the “how“. Am I right? Although it may seem rather simple, (and the act of it is, trust me!) there are quite a few options to learn how to change colors in crochet and I want to cover as many of them as possible in this post. First I will show you how to change colors in crochet projects in a variety of locations with the most common stitches, Then we’ll move on to answer your questions about the resulting ends – do you cut them, carry them or work over them? In this free guide you will be able to take it one step further and apply your specific color changing needs. For instance, if you want to change colors in the middle of the round and work over your non-working strand. You will have step-by-step instructions for how to do that. Maybe you are working in rows and you want to carry the yarn. Yep, there are instructions for that too. Whereas this post is a general “how to change colors in crochet guide”, this free download will allow you to get laser focused on your specific project. Now let’s move on to our first topic, how to change colors in crochet projects at the end of a row. When you want to crochet stripes or color blocks and create a clean transition from one color to the next, changing colors at the end of the row is the way to go. At the end of the row before you want the color change to occur, work only half of your single crochet stitch. In other words, insert your hook into the last stitch, yarn over and pull up a loop and leave it there. Create a slip knot with your new color and place that loop on your hook. Then pull that slip knot loop through the two loops on your hook. That will complete the single crochet and your new color is ready to work with! From here, you will continue with your pattern instructions for the next row. At the end of the row before you want the color change occur, work only half of your half double crochet. Follow these steps: yarn over, insert your hook into the last stitch, yarn over and pull up a loop (this will leave you with three loops on your hook). Place you hook down and make a slip knot with your new color. Place that slip knot loop on your hook and pull it through the three loops on your hook. That will complete the half double crochet and your new color is ready to work with on the next row! From here, you can continue with the pattern instructions for the next row. At the end of the row before you want the color change to happen, work half of your double crochet stitch. To do so yarn over, insert your hook into the last stitch, yarn over and pull up a loop. Yarn over and pull through two loops. Leave it here with two loops remaining on your hook. Make a slip knot with your new color and place that loop on your hook. Pull the slip knot through the two loops on your hook completing the double crochet stitch and fastening on the new color. You’re all ready to start working the next row of instructions with the new color. If you read through the instructions for all three of those stitches, you may have seen a trend. The new color should be added in the last motion of the last stitch you want in that color. This will always be the case. If this is your one take away from this post, you’re in good shape! Let’s move on now to some of the other options. What if you want to change colors in the middle of your row? Does the same rule of thumb apply? Yes, it sure does. Let’s have a look. When you want to change colors for the purpose of creating visual interest or if you’re using a color graph, changing colors in the middle of the row is the way to go. Let’s break it down by stitch again so you can see it in action. In the stitch right before you want the color change to occur, work half of your single crochet. To do so, insert your hook in the last stitch to be worked by this color and pull up a loop. Make a slip knot with the new color and place that loop on your hook. Now pull that slip knot loop through the two loops remaining on your hook. This will secure the new yarn, complete that stitch with the first color and set your next stitch up to be in the next color. In the stitch right before you want the color change to happen, work only half of the half double crochet. Here is how you do that: yarn over, insert your hook in the last stitch to be worked by this color and pull up a loop. This will leave you with three loops on your hook. Now make a slip knot with the new color and place that loop on your hook. Pull the slip knot loop through the three loops on your hook to secure the new yarn, finish the stitch in the right color and set you up so your next stitch will be in the new color. In the stitch just before you want the new color change to occur, work half of the double crochet. To do so, yarn over and insert your hook in the last stitch you want worked in the old color, yarn over again and pull up a loop. Then yarn over and pull through two loops. This will leave you with two loops on your hook. Make a slip knot with the new color, place that loop on your hook and pull through the two loops on your hook. That will finish that stitch in the old color, secure the new yarn and set you up so the next stitch is worked in the next color. Remember our rule of thumb? As long as you complete the last motion of the stitch with your new color, you will always have a clean transition from one color to the next. But what if you aren’t working in rows? Let’s cover how to change colors in crochet projects that are worked in the round. When you want to crochet color blocks or stripes in your projects while working in the round, changing colors at the end of the round is the way to go. Like we saw for changing colors in rows, let’s see how to change colors when crocheting rounds with the common three stitches first. Then we’ll move on to changing colors in the middle of the round. At the end of the round before you want the color change to occur, work only half of the single crochet. To do so, insert your hook in the last stitch of the round, yarn over and pull up a loop. Leave it there. Make a slip knot with the new color and place that loop on your hook. Now pull that slip knot loop through the two loops remaining on your hook. With the new color, you will join to close the round as your pattern suggests. This will secure the new yarn, complete that stitch with the first color, close your round and set your next stitch up to be in the next color. At the end of the round before you want the color change occur, work only half of your half double crochet. Follow these steps: yarn over, insert your hook into the last stitch of the round, yarn over and pull up a loop. You will have three loops on your hook. Now make a slip knot with the new color and place that loop on your hook. Pull the slip knot loop through the three loops on your hook to secure the new yarn, finish the stitch in the right color and set you up to close the round. Follow your pattern to join the round and you’re set up to work the next round in your new color. At the end of the round before you want the color change to happen, work half of your double crochet stitch. To do so, yarn over, insert your hook into the last stitch, yarn over and pull up a loop. Yarn over and pull through two loops. Leave it here with two loops on your hook. Make a slip knot with the new color, place that loop on your hook and pull through the two loops on your hook. That will finish that stitch in the old color, secure the new yarn and set you up to close the round. Follow your pattern to join the round and you’re set up for the next round in your new color. You will have this memorized by the end of this post! When you want to change colors for the purpose of creating a visual in your project or if you’re using a graph while working in the round, changing colors in the middle of the round is the way to go. Are you ready for the good news? We’re not learning anything new here. Just a review! But let’s break it down by stitch again so you can see it in action. You will notice that in each of these mini demos I am working on a tubular crochet piece. If you’re working on a round, flat crochet circle, you will follow the same steps! It may look a little different, but you’re doing the same thing. In the stitch before you want the color change to occur, work half of your single crochet (insert your hook in the last stitch to be worked by this color and pull up a loop). In the stitch before you want the color change to happen, work only half of the half double crochet. Here is how you do that: yarn over, insert your hook in the last stitch to be worked by this color and pull up a loop (this will leave you with three loops on your hook). In the stitch before you want the new color change to occur, work half of the double crochet. To do so, yarn over and insert your hook in the last stitch you want worked in the old color, yarn over again and pull up a loop. Then yarn over and pull through two loops. This will leave you with two loops on your hook. To change colors in crochet projects, complete the last motion of the last stitch in the new color. It doesn’t matter what stitch it is (puff stitch, star stitch, quadruple treble…) when you complete the last motion of that stitch with the new color, you will have a clean transition where both stitches are fully worked in the color you want. Now although we have already covered how to change colors at the end of a round, let’s zoom in on granny squares for more clarification. Although the technique is the same, it feels different to change colors in crochet granny squares. In this instance we are working in the round (despite what the name implies) so we need to follow the principles for changing colors at the end of a round or in the middle of a round depending on the look you’re going for. If you want to change colors at the end of your granny square round, this is what you need to do. The same rule of thumb applies to granny squares too – complete the last motion of the stitch with your new color. Need step-by-step instructions for those color changes? Download my free guide here! What happens after you change to the new color? Everything we have covered so far just gets you to the point where you’re ready to work the first stitch in the new color. This is only half the explanation needed to know how to change colors in crochet projects. So what do you do from there? Now you must decide how you will handle the yarn after you have made that first initial color transition. There are three main ways to handle the yarn after you have changed to a new color. Let’s look at all three. You can create a striped look without endless ends to weave in by “carrying” the yarn as you work. No cutting. No extra ends to weave in. Any break in yarn creates a potential weakness in your project and it also creates more work for you. Carrying the yarn when you change colors in crochet projects cuts back on both of these which is why I recommend doing it whenever you can. This is, however, the more advanced method of dealing with the yarn after a color transition but that doesn’t mean you have to be a pro to do it. First things first, what on earth do I mean by “carrying” the yarn. When you carry the yarn, you are simply leaving that old color in the last spot you left it and picking it up on the next row or round when you get back to it. This carries the yarn up to the next row or round. Notice that the act of changing to the new color doesn’t change, we still complete the last motion of the stitch with our new color (our rule of thumb) but rather than break the old yarn, we simply drop it and pick it up later. Carrying the yarn at the end of rows is a great way to achieve a horizontal stripe look. In order to pick up the old color, you need your hook to be in the same location. So if you’re working in rows and carrying the yarn, you need to factor in the flip. That means you will work your first row in the new color, flip it and work a second row in the new color. When you finish that second row, the old color will be right there and ready for you to pick it up and start working again. A potential downfall to this method is that no matter what stitch you’re working, carrying the yarn when you change colors in crochet creates “floats” that are visible on one side of the project. Because of this, the carried yarn should have the shortest “distance to travel” so the floats are shorter and less noticeable. In other words, you want to minimize the height to the next color change because you will see the float on the edge of the work. Use a short stitch like the single or half double crochet. Change colors every two rows. Remember: the taller the stitch, the more distance the float has to “travel” and therefore the more visible the float will be. There’s got to be a work around, right? Yep. Adding a border around your project when it’s finished will hide those floats completely as long as you work your border stitches over them. It’s like pure crochet magic! Can you carry the yarn and use more than two colors? Although our example here uses only two colors, it is possible to plan a striped pattern which incorporates more than two colors. Just remember that the more distance the carried float has to travel, the more noticeable it will be. You will need to do a little preparation when planning your color repeat to make sure the floats are as short as possible. Another option is to keep “bobbins” (or little sections of yarn you wind in a ball) of each color in your repeat attached to your project at once. When you get to each color change, you can pick up the next bobbin and keep going. This is great if you want to, say, cycle through three or more colors in the same sequential order. So what about carrying the yarn when you change colors in the middle of your row? Carrying the yarn in the middle of rows is a great way to achieve a vertical stripe look. If you look closely at the point where white meets tan, you can see the little white floats. Fortunately they are quite short and hardly noticeable. When you want to carry the yarn in the middle of your row, just remember your rule of thumb and complete the last motion of the last stitch with your new color. Then follow your stitch pattern until you reach the old color you dropped, pick it up and start working once again. As with carrying the yarn at the end of rows, you can also use multiple colors of yarn in your project and carry them to change colors in the middle of your row. This is the basis of an incredible crochet technique called Intarsia crochet and is the method used in many plaid crochet patterns! However, the more intricate your color changes (how many of them per row), the more work you have to put in. You will need to wind the yarn in sections called bobbins (just little balls of yarn, really) and keep them all attached as you work your project. A great example of this is the Big Tartan Scarf I demonstrated here. If you’re working in the round and changing colors at the end of your round, you will not have to factor in the flip since crocheting in the round doesn’t require you flip your project. The goal is is the same. Allow the yarn to have the shortest “distance to travel”. In other words, you want to decrease the height to the next color change because you will see the “carry” or the float on the opposite side of the work. For hats or any project where the wrong side isn’t visible, this is no big deal. You won’t see them any way. However, a granny square for instance might be seen on either side and you want to keep those floats less noticeable. You can also plan a striped pattern that incorporates more than two colors when you change colors at the end of a round. Just remember that the more distance the carried float has to travel, the more noticeable it will be. Again for projects that aren’t reversible, it doesn’t matter but for projects where you will see both sides, it may be better to cut the yarn than carry the yarn. When you want change colors in the middle of the round, you can avoid breaking the yarn but doing so means your color transition will happen in the same place giving you a vertical color block. For projects that are reversible, the best option is to make that transition every single round. When you do so, you won’t have long visible floats. For projects like hats that aren’t reversible, you can use more color choices and change colors in more than one spot but keep in mind the float that is created when you pick each color up. As a general rule, I like to keep my floats no more than one inch long. With this approach, you will also need to keep track of each color while it’s attached to your project. For this approach, you will need to wind the yarn in sections again and keep them all attached as you work your project. A great example of this is the Polka Dotty Crochet Hat I demonstrate here. You can also use this method to crochet letters or typography into your crochet project! Let’s move on to another method of dealing with the yarn after you change colors in crochet projects. Cutting the yarn. When you want fewer color changes, carrying the yarn loses its practicality. Sure, you can carry the yarn up the side of dozens or hundreds of rows if you plan to go back to that color later but you’re wasting yarn in the process. On another note, you may only plan to use each color once. In which case, carrying the yarn is impossible since you won’t pick it up again. So what do you do? In any of these scenarios, cutting the yarn is the most practical choice and we have to deal with the tails as a result. In the mini stitch demos above, I made a slip knot at the initial join and I did this for one main reason – to secure a break in the yarn and do my best to strengthen a weakness in the project. I do this as often as I can. In episode 1 of B.Hooked TV, I show an alternative to creating a slip knot where you simply loop the new color around the hook and pull it through to complete the last motion of the stitch. My one caveat to this particular method is that you knot the two ends at the back of the work to make sure it’s secure. Dealing with the tails is the part we all dread but it must be done if the yarn is cut mid-project. I always recommend knotting the two ends before weaving them in. This way if when they poke out later, at least the break was secured with a knot. knots, however, don’t have a great reputation in projects. If you can’t dream of making a knot in your project, you have to find an alternative to secure that break. Some people will instruct you to use a Russian join, which “magically” connects the two ends of yarn. It’s a really cool technique but it has it’s limitations too. It works best with yarn that has some kind of animal fiber in it and you have to get the transition point right so your color change happens exactly where you want it to. 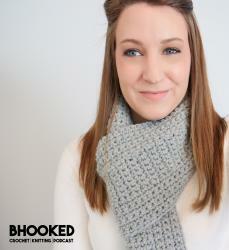 Others might suggest to leave out the knot completely and just weave in the ends. Just remember, the only thing securing that break is the weaving of those ends. Make sure they’re long and make sure you really do a good job. Let’s move on to our third and final method of “dealing” with the yarn after you change colors. If you want more than vertical or horizontal stripes and you don’t want to cut the yarn and deal with weaving in all the ends, working over the yarn is probably the right choice for you. Working over the non-working color (and by non-working, I mean the color you’re not currently using) gives you the most flexibility as to where and when you make your color transitions. To add the new color for the first stitch, complete the last motion of the last stitch with the new yarn. From there you will lay the previous yarn to the back of the work and crochet your stitches over it until you want to change colors again. This technique is called Tapestry crochet. It gives you the flexibility to have a reversible project (it looks the same on both sides) and prevents you from cutting the yarn and weaving in additional ends. Sounds perfect, right? There are few draw backs. First, the color you’re working over can usually be seen through the stitches. Especially if you’re using two contrasting colors like dark gray and ivory or burgundy and white. It also uses more yarn. That non-working yarn continues to run down as you lay it along each row to work over it. Also, working over your non-working strands will change the gauge of your stitches so if you plan to mix this method with a single color section, you will notice the stitches that are worked over yarn will look tighter. I usually drop down a hook size on the areas where I’m not working over a strand to make up for that difference. You can see a great example of this in my Laundry Mat pattern. Just to clarify, you can work over the yarn in any situation, rows or rounds! However, you do have to watch your stitch selection when using this method after changing colors in your projects. It is best to use this method when you are using a solid stitch pattern. The carried yarn will be seen if you are using a stitch pattern that, for example, uses chains or skipped stitches. Now as far as color options go, here is it’s limitation. It is possible to use up to three colors at a time while using this technique. However, when you add more colors from there and are working over more than two strands at a time, the work will be thick and have less drape. It’s not impossible but the fabric will be thick and dense. Not too long ago I published an Argyle crochet hat that uses this method, working over the yarn, using a total of three colors. This meant I worked over two strands at a time. To preserve the drape and stretch I needed for a hat, I used a lightweight yarn. This is a great work around if you really want to use more than two colors but you need your fabric to have a better feel to it. You can see the technique of working over the yarn with three colors in that Argyle Hat pattern. Still not sure which method is right for your project? I think you’ll find the pros and cons section of my Ultimate Guide to Changing Colors extremely helpful. You can change colors at the end of a row or round or in the middle of a row or round. You can carry the yarn to prevent cutting the yarn after the color change. You can cut the yarn and weave in the ends after you change colors. You can work over the color you aren’t using to prevent cutting the yarn after the change. Changing colors in crochet granny squares follows the same technique as changing colors in the round. Use the same techniques to add a new skein of yarn when it runs out! The Ultimate Guide to Changing Colors In Crochet will help you relate what you have learned here to what you want to accomplish with your project right now. It was quite a while before I felt comfortable changing colors in my crochet projects and even longer before I felt confident that they wouldn’t fall apart at the color transition. This confidence came with practice and lots of mistakes. Hopefully with this post you can avoid the trial and error I went through and with my free guide, you can quickly accomplish that color change with step-by-step instructions. Loved this post? Pin this pic to save it!